SOL Camp & Hike Emergency Bivvy 01401138. 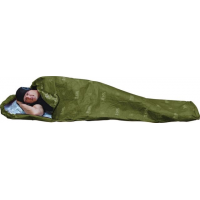 Reflects 90percent Of your body heat and only weighs 3.5 oz.New polyetheline material is quiet and durable. SOL Camp & Hike Adventure Medical Pocket Survival Pak 01400757. 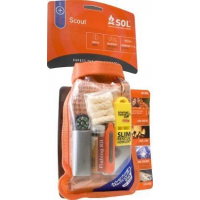 SOL Camp & Hike Adventure Medical Scout Emergency Kit 01401727. A professional-grade RF-welded waterproof bag keeps contents dry in any conditions. SOL Camp & Hike 2-Person Emergency Bivvy 01401139. 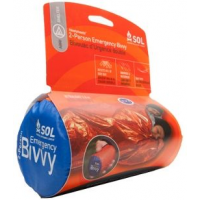 If you and your partner are forced to spend an unexpected night out, you'll be grateful to have the lightweght SOL 2-person Emergency bivy. It reflects up to 90% of your body's heat back to you. 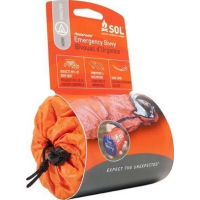 A thermal survival blanket that won't shred like mylar, the SOL (Survive Outdoors Longer(R)) All Season blanket can be used as a gear cover, tent tarp, emergency blanket or firewood hauler. Don't let a breakdown or power outage become a dangerous situation. 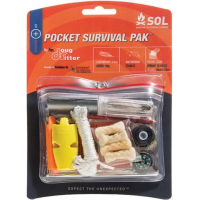 The SOL All-Season survival kit contains the essentials you need to stay warm, signal for help and be safe. Essential kindling for survival situations, the SOL All-Weather fire cubes ignite easily and are designed to stay lit even in the worst conditions. Be prepared for nearly any backcountry repair job with SOL duct tape.